You can use a PIC microcontroller and an LED matrix to create a binary clock (or if you prefer you can wire up individual LEDs). This project uses an LED matrix block as it saves lots of wiring. ...and it is a good way of learning how to read binary (well up to 9 any way!). You can represent the numbers 0-9 using 4 binary digits so only four leds are needed for each time digit. There's a binary-decimal conversion table here. To display hours, minutes and seconds (2 digits each) you need 6 binary digits in total (depending on whether you use a 24 hour clock the top digit needs only 1 or 2 LEDs). The next two digits represent 0-59 seconds. Note: You could use a 5x7 led matrix as only the right hand 4 leds (also only 6 rows)are used in this project. The black rectangle, in the diagram above, shows which leds you need to look at - the rest are not used in this project. You read the clock starting from the top and read horizontal row of four LEDs as a binary number. Each LED that is on represents a one and each LED that is off represents a zero. You then use the conversion table to translate it into decimal until you become so good at it that you won't need the table! This project uses the same hardware as the led matrix project using a 16F88 PIC microcontoller and an LED matrix. Its worth taking a look there as the same hardware description applies on how to multiplex the display. I'll just say here that instead of using 64 output pins only 10 are needed to drive the display. Binary clock display Red 8x8 LEDs matrix (for convenience) you only really need a 6x4 LED matrix and you can only buy an 8x8 or a 5x7! 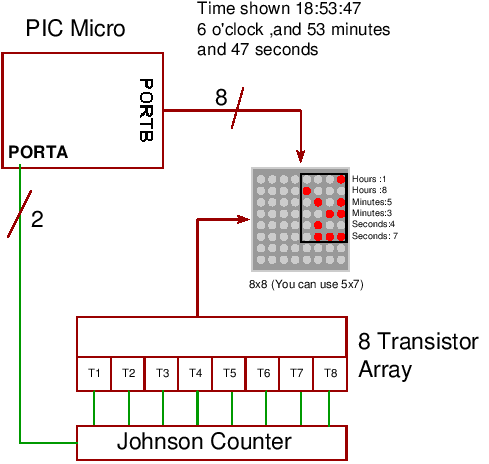 Binary Clock display project details. Target 16F88/16F84 (retargetable to other PICs that have an enough pins). Software notes Multiplexing the display/clock algorithm. The code is simple to follow and everything is done in main(). The multiplexing method is the same for the led matrix project so have a look there for the software description of that method. The only difficult part is to correctly control the time display but its not that difficult as you can see in the code. Note definitions FLIPLR and ROT180 allow you to alter the display orientation without re-wiring the board! You can improve the project to make it into a full clock by adding a set of keys in the same way as the RTC project. This would let you set and change the time. This project relies on the accuracy of the microcontroller's internal oscillator which is only 1% - and this is not very accurate at all. You can expect to loose ~15 minutes per day! For a better accuracy use an external crystal as shown in some of the other projects. If you use a crystal the clock will be accurate to a few minutes per month. Note: Even when using a standard crystal the board layout is very important - i.e. it will be a lot better than 1% but won't be as good as watch crystal accuracy. You could use a DS1307 clock chip but even these accurate to about 2 seconds per day (loss) as they rely on a 20ppm watch 32kHz crystal - good track layout and correct capacitive crystal loading is needed to get the accuracy shown. You can find some notes on comparing ppm clock accuracies here.